Guadalajara-based artist Lorenzo Duran's work is literally a cut above the rest. For the past four years, the Spanish artist has been using leaves for his delicate compositions, piercing the thin foliage to depict animals, figures, and geometric patterns. With the exactness of a surgeon, he removes the papery membranes to produce works that resemble shadow boxes, and traditional Spanish papel picado. Utilizing elements of nature, Duran chooses the raw elements of nature to complete his amazingly fragile leaf cuttings. As a child, Duran had always painted an sculpted. In 2008, he became inspired by watching a caterpillar eating a leaf and began using plants as the medium for his line of carefully crafted pieces. Believing that the colors, forms and textures of his canvases are works of art in themselves, he selects each leaf carefully, considering its shape before beginning to remove segments to make an image. One of Duran’s most recent commissions if for is Leagas Delaney’s project “Plant for the Planet,” a campaign to showcase the leaf’s ability to absorb CO2 and combat climate change. I love Lorenzo Duran's leaf art. Awesome masterpieces! Guadalajara-based artist Lorenzo Duran's work is literally a cut above the rest. For the past four years, the Spanish artist has been using leaves for his delicate compositions, piercing the thin foliage to depict animals, figures, and geometric patterns. Utilizing elements of nature, Guadalajara-based artist Lorenzo Duran chooses the raw elements of nature to complete his amazingly fragile leaf cuttings. Believing that the colors, forms, and textures of his canvases are works of art in themselves, he selects each leaf carefully, considering its shape before beginning to remove segments to make an image. 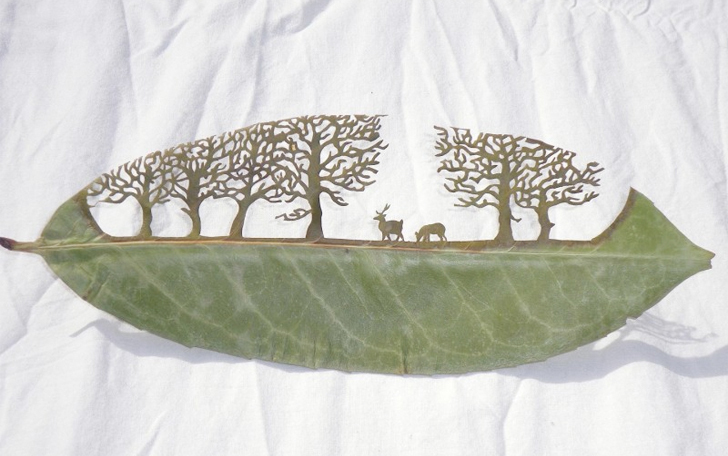 Depicting forms from nature, Duran creates extremely detailed cut-aways from leaves. Each work is created by cutting away small, fragile pieces of the leaf. In 2008, Duran became inspired by watching a caterpillar eating a leaf, and began using plants as the medium for his line of carefully crafted pieces. With the exactness of a surgeon, he removes the papery membranes to produce works that resemble shadow boxes, and traditional Spanish papel picado. One of Duran's most recent commissions if for is Leagas Delaney's project, "Plant for the Planet", a campaign to showcase the leaf's ability to absorb CO2 and combat climate change. Personal works incorporate names and images from the artists' friends and family.